This is a great comforter. I initially bought it to be a duvet insert, but the duvet was a hassle, so I used this without. It looks nice. It's heavy, but not stiff. It's comfortable and soft. It has washed well and remains in excellent condition a few years later. If I had a complaint, it would be that the comforter was not quite as wide as I had hoped (I like a very wide comforter). That said, I'd gladly choose this comforter again. Add cozy comfort to your bed with the Superior All-season Stripe Down Alternative Hypoallergenic Comforter. This comforter features a microfiber shell with down alternative fill and a baffle box construction. A classic white color and a subtle stripe pattern make this comforter a great match for a variety of decors. I love a down comforter in the winter. I live in the mountains where winter can bring very cold weather and power outages, but with a good down comforter the nights can be warm and cozy no matter. This product is perhaps the softest comforter I have ever owned. When it arrived and I made my bed with it, i could not believe how soft it was! Something in my mind said, "But, is it warm?" That night when I went to bed, I felt pure luxury in the soft warmth it provided. Two days after it arrived, our temperature dropped to 17 degrees.and I found great comfort and warmth in this comforter. I can honestly say to anyone considering this purchase that you will be amazed at the soft comfort and the warmth it provides. Now, the information with it says that it is washable; however, I have not had it long enough to try that. I can tell you that each time I change my bed, I fluff the comfort and it is like brand new. I have had it about 6 weeks and I can honestly say that no other comforter has ever pleased me to this extent. I encourage you to purchase this and enjoy REAL comfort! Just received this comforter yesterday and I absolutely love it! It's just the right weight for any season. I would highly recommend ! I ordered the king size and the drape on the sides is perfect! You won't be disappointed. I purchased the comforter in late summer but, only just yesterday (mid November) got around to putting it on our bed. We have a king size bed. I am used to large sheets and blankets. However, I was shocked at how heavy this comforter is. I struggled for half an hour just trying to get the duvet cover on it. The weight made it quite uncomfortable to sleep under. I ended up tugging it off the bed so I could get some sleep. When I shopped for the comforter, I looked for a hypoallergenic comforter that was the right size for my duvet cover. I never thought to check for the actual weight. If it was a twin size, it might be OK but, as a king it is too heavy. We have a King Size Bed and there is plenty of room to tuck in at the end of the bed and still have sufficient room at the head. It hangs over each side about 4" also which is great because our last one just barely covered the top of the bed. I like the subtle stripes and it looks great with my new quilt. The quality of this is good. However, I was very disappointed that the king is way too small to fit my king size mattress. It would be perfect of it was just a couple inches wider on each side. Frustrating. I was very disappointed in the comforter. I ordered it for a duvet insert for my daughters room. I chose this item based on the price, size and the amount of fill in the comforter. When the comforter arrived it didn't even fill out the package it came in. I was very flat, and looks nothing like the full puffy comforter displayed in the picture. Would not buy this product again. nice and soft and downy,this comforter is really good when it is very cold out and you would like a very nice warm cover.I end up giving mine to my Granddaughter when she went to college,she loves it all year around.Although she would rather have some choice in extra colors,but since it was already white she did not mind to much.Very little shrinkage,color stays good. The cover (shell) of the comforter is polyester and the fabric does not breathe. Because I have emphysema it makes sleeping difficult. A cotton cover would have been ideal. I must have been up a half-dozen times during the night. No complaints however if you get hot easily, this might not be the best option for you. I'm always cold and this comforter makes me hot. I read all of the reviews before purchasing this comforter, and now that I have it I am shocked that the overall rating is so good. I washed the blanket right away because I love clean, soft linens, but the material on the blanket started fraying after the very first wash! It does not have ties or buttons on the corners so I did not intend to put it in a duvet cover, but now I will have to because it looks like an old, heavily used blanket and I have not even slept with it yet. It pilled up after the first wash and the filling turned into huge balls in the dryer. You have to pull apart the filling in each square after each wash. This is now a dog blanket in our house. Really nice and fluffy comforter. It's nice and large, so it doesn't leave an empty edge in our duvet cover. Great comforter. Just the right size for my duvet cover. Also the right weight for the spring/summer and fall seasons. Purchased to replace older one that was not hypoallergenic. Fits queen size duvet with little room at top, which I prefer. That makes it easier after you wash the duvet. Have used Fall and Winter and no complaints. Would purchase again. We bought this as a gift and this was better than expected. Outstanding quality for a great price. We gave this to my parents as a Christmas gift, and they say that it is extremely warm. I would definitely recommend this comforter, especially for those who suffer from allergies. I have ordered several of these for my house and my beach house. They are easy to wash. They keep their shape and is the perfect solution for those who are allergic to down. I recommend this comforter to those who have allergies! Very comfy but definitely not all season. It gets very warm. Nice all season comforter with excellent loft. Works great on my daybed which is actually being used as a couch, but the comforter is perfect for when I have a guest or mainly my housekeeper house sitting my home and dogs more importantly. "Does this product have any runaway feathers? The last down comforter I got had feathers everywhere around the house and I was not pleased. " No runaway feathers at all. Very warm comforter. It's down alternative so there are no feathers. "I ordered this comforter and received it today. The product details say comforter size (King) is 106x90, but the package it came in states comforter is 108x90 inches. I'm hoping it still works with the duvet cover I bought!" 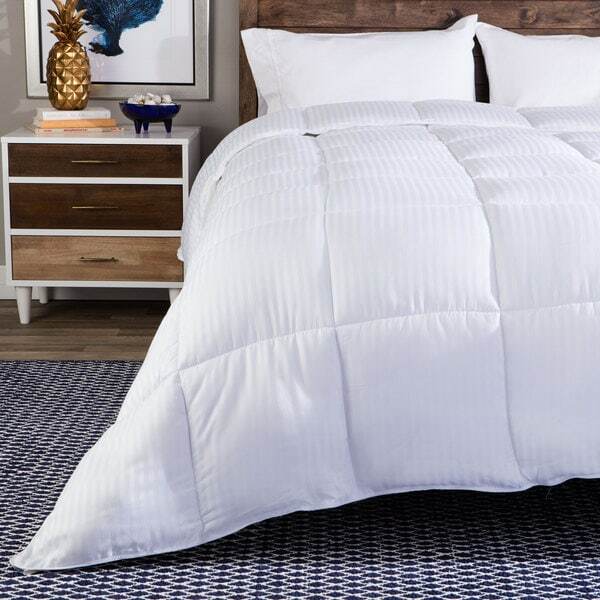 Hello arivas, you shouldn't have a problem with the All-season Luxurious Down Alternative Hypoallergenic Striped Comforter, Overstock.com stands behind every product we sell. When necessary we can contact suppliers if a product issue arises. Please feel free to contact us again with any further questions. Thank you for shopping with us! I just purchased this duvet and it fit the cover I purchased perfectly. I actually have a little room to spare. "What is the thread count for this duvet?" Thread count does not apply to microfiber. "What is the cover material? It looks like cotton, but the description says "microfiber"." Thank you for contacting us zinfandel18. The material is Microfiber. We apologize for any confusion we might have caused. Please let us know if you have any further questions. Its microfiber, and it snags on EVERYTHING, too! "Is this comforter made to be used with the duvet cover?" Hello toatley, Yes, a duvet cover would help keep the comforter clean and is great for versatility. Thank you for shopping with us. Worked very well with my daughter's duvet cover. "Are there ties on the corners to keep a duvet cover in place?" Hello sjnielsen00, Thank you for inquiring about the All-season Luxurious Down Alternative Hypoallergenic Striped Comforter. There are no ties on the corners of the duvet. Thanks for shopping with us.